Did I really write currants? Oh yes I did! There were 2 Zucchinis remaining in my fridge, so this past weekend baking moisty muffins was a plan. My "go to" recipe for these moisty yummy muffins is adapted from Janet Pierce's Zucchini Chocolate Chip Muffin recipe. A few years ago I discovered it by googling and locating it on allrecipes.com. I like the flour/ sugar ratio here - twice as much flour as sugar. Whenever possible when baking/ cooking, I use Olive Oil, Egg Whites (2 Egg Whites = 1 Whole Egg) & Soy Milk, so there are changes. No chocolate for me, either. The recipe in hand, I was on my way! 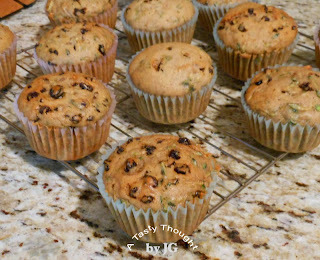 Raisins are always an ingredient in my Zucchini Muffins. When I reached for the raisin canister, I discovered that my DH had snacked the day before. No problem - there always is a Plan B! Suddenly, I remembered that in my pantry there was an unopened box of currants that I use when baking scones. The Currants (small Raisins) were added into the batter. What a great substitution! 1/4 Cup Milk - I use Soy Milk. Wash 2 small Zucchini in cold water and dry. Shred Zucchini to measure 1 Cup. In a large bowl combine dry ingredients, stir. In small bowl slightly beat Egg Whites. Add Egg Whites to dry ingredients. Stir until moistened & combined. Divide batter evenly between 12 muffins cups. Bake 28 minutes or until cake tester comes out clean. Remove muffins from pan and cool on cooling rack. As the 12 muffins were cooling on the rack, suddenly 1 disappeared! They were so good! Currants will now always be an ingredient. Now, there's a treat in our freezer - a 4 pack of Currant Zucchini Muffins in a Ziploc Freezer Bag. If you are planning a Halloween Party, pumpkins just the right size will be purchased! Food is also in your plans. For a yummy punch that is enjoyed by children of all ages, look no more! Halloween Sherbet Punch is the one for you. 2 ingredients - that's all you need to have your guests ladling more of this tasty frothy orange colored beverage into their cups. Orange Sherbet and 7Up make one great brew! *I use Diet 7UP. In a large punch bowl place 1 Quart Sherbet. Pour 2 bottles 7Up Soda in punch bowl, pouring some over Sherbet. Stir a little to mix. Results in frothy, softened Sherbet on top. Ladle into cups adding some of the Sherbet. Replenish the 7UP + Sherbet, as needed. Find your grocery list and add 7UP and Orange Sherbet! This brew has been a family fave for many years. A treasure much like the plastic spider on our table is. 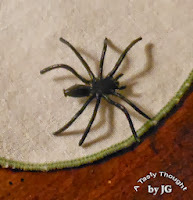 Our grandson now points out to others that the spider is "not real". Small scoop of Vanilla Ice Cream will be added! Columbus Day Weekend! I hope that you have enjoyed it. This holiday weekend came quickly! 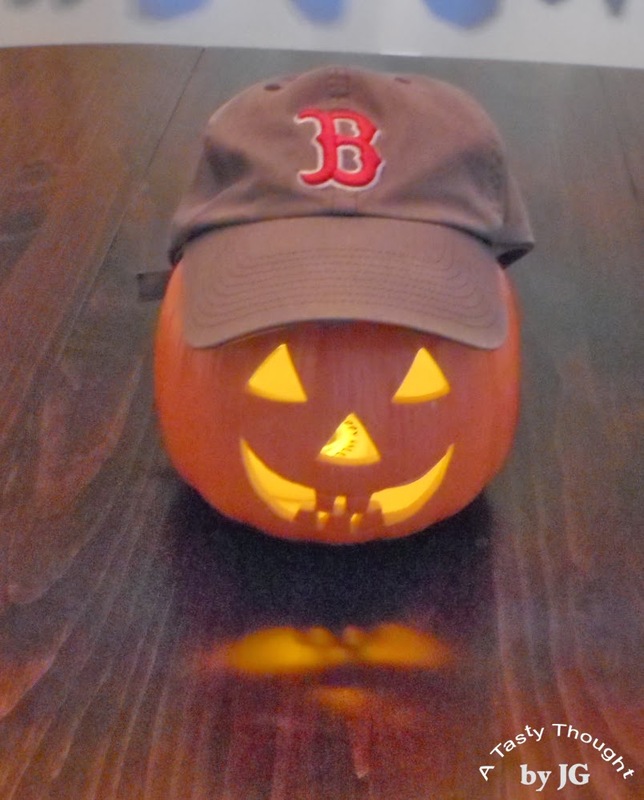 October is a FuN month - filled with fam birthdays, football games and produce of autumn. Last weekend we ventured west on the MA Pike and then on to upstate NY to attend a beautiful wedding. 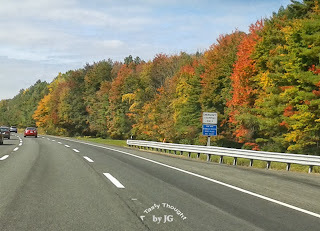 Driving on the highways between gorgeous trees that were beginning to change colors was so sweet - shades of greens, yellows & reds. On the return trip home we not only viewed the colorful foliage, but at a rest/food area there was a Farmers' Market. An abundance of the fresh local apples from the nearby orchards were available to purchase. Cortland Apples! Cortland will always be my fave eating & cooking apple. The contents of a fill your own bag of these juicy tasty pieces of red fruit is now in our fridge. My plan? 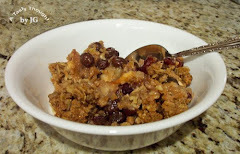 Bake Apple Crisp with Craisins/ Raisins! 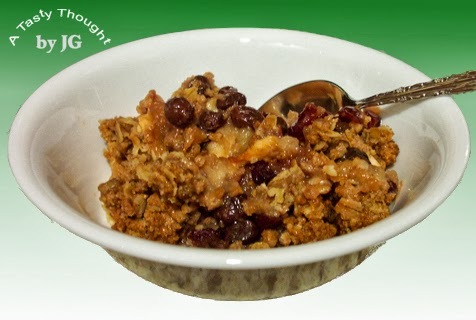 A crunchy oat topping covers slices of fresh peeled fruit in this yummy dessert. The apple slices are also surrounded by sprinkles of Craisins & Raisins. Add in Cinnamon & Nutmeg = Yum! It's extra easy, because no pie crust is required for this tasty dessert! Spray PAM in 8" x 8" glass baking pan. Rinse apples under cold running water & dry. Place peeled sliced apples in pan. Add Craisins & Raisins and mix in. Bake 45- 50 Minutes or until apples are tender. This is definitely a family fave apple dessert here! Starting in the fall, there are breakfast foods that make a presence on my table when it is chilly outside. It begins - while stepping onto the cold floor I remember hot cereal exists. This week may bring warm temperatures, but the overripe banana sitting in my fruit bowl reminded me of Banana Cream of Wheat! It is Autumn! Yes! There were enough cereal granules in the Cream of Wheat box to prepare 2 servings. The directions on the box are followed. However, there definitely are changes as to the ingredients. 1 overripe Banana cut into thin slices is added to the 1 quart sauce pot containing the Cream of Wheat granules. Soy Milk rather than Whole Milk or Water is used. 1/8 teaspoon each of Cinnamon + Nutmeg is added in, also. Turn on the Medium heat and you're on your way to start stirring! Cream of Wheat ~Banana Flavored is great! Calcium, Potassium + Cinnamon & Nutmeg.